Being an adult requires that you do things you would rather not do. My father used to say that he ate his vegetables so the kids would eat theirs. He had a life-long dislike of most vegetables, but he also knew that his kids would mimic his disdain, even if we didn’t dislike vegetables. For me, one of the things I do because I should is eat yogurt. I don’t really like it, but there are rewards that are hard to duplicate. When I started eating yogurt daily, I reached into the refrigerator for the individual cups that I bought each week. I made sure I had several flavors to keep it interesting. Once I tried Greek yogurt, I was hooked, but the cost of those little cups was a concern. Making yogurt at home isn’t difficult but what about Greek yogurt? What is the secret to that? Not much of a secret really. Greek yogurt has been drained of whey. That’s it. No magical process. No special ingredients. I bought a large container of plain yogurt to use as the starter culture. I froze individual portions to save them. Now, when I make a batch of yogurt, I take one cube out and allow it to thaw while the milk is heating and cooling. It doesn’t matter what kind of milk. Use skim, 2% or whole milk. All kinds will work. 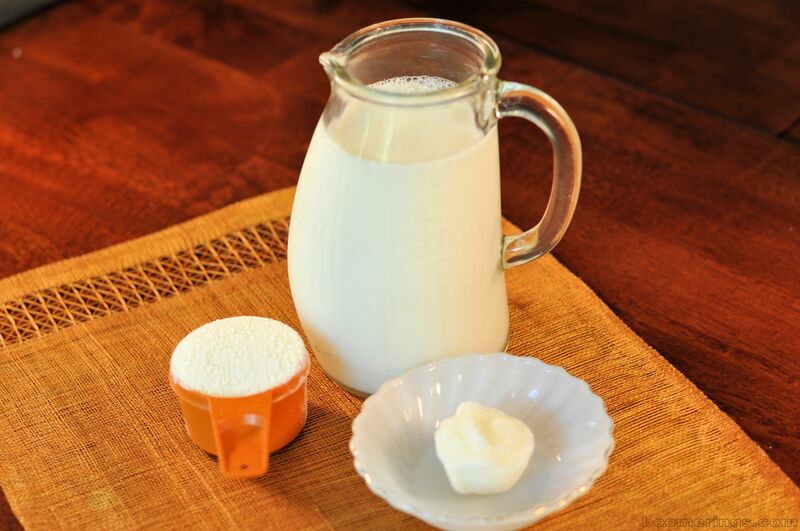 The milk powder adds more milk solids to the mix and produces a thicker yogurt. When it’s done, flavor your yogurt in any way that suits you. I put in a spoonful of jam. Honey would be good, as well. Put in nothing, if you can stand it. I have to admit, I like my home-made yogurt better than anything I can buy at the store. Mix powdered milk into the milk in a sauce pan. Using a candy thermometer, heat the milk mixture until the temperature reaches 180 degrees. Remove from heat and allow to cool to 115 degrees. Spoon out approximately ½ cup of the warm milk and whisk it with the yogurt starter. Add this mixture back into the milk and mix throughly. Incubate from 4 to 12 hours until thickened. The yogurt can be left in the same pan to incubate or put into a jar or bowl. I leave mine in the same pan I used to heat the milk and it works just fine. 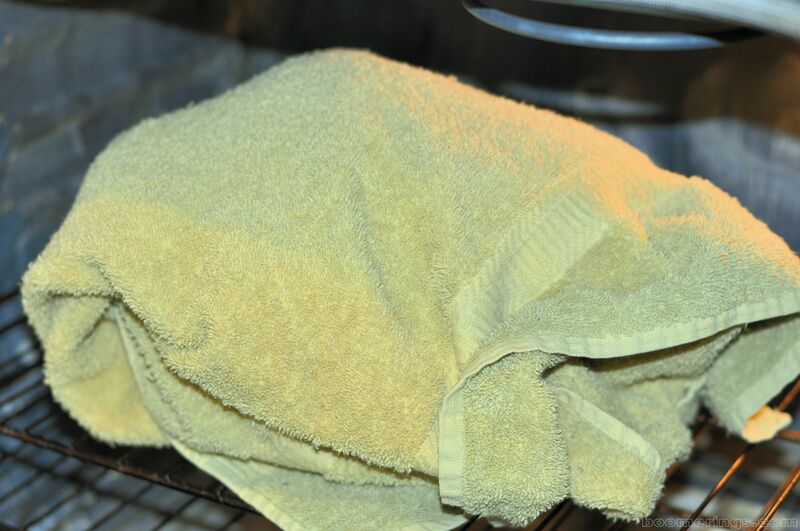 To incubate, I heat up the oven to the lowest setting and then turn it off. The pan is wrapped in a towel before I put it into the oven and I leave it in place for about 6 hours. 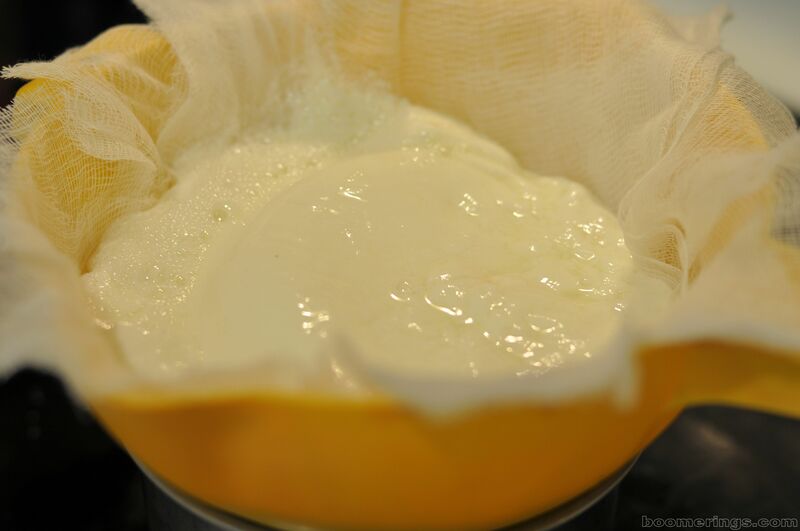 When the yogurt is thick, I put the batch in a colander, lined with cheesecloth, to separate the whey. Now, it’s Greek! What to do with the whey is a work in progress. I’ll get back to you on that. Posted on April 14, 2015 April 14, 2015 by Twain FarePosted in Food, Frugal Solutions, RecipesTagged copycat recipes, DIY, food, food budget, recipe, yogurt.